Bette Davis stars in four major motion pictures this year. However, this is the only one with Errol Flynn, which depending on one's point of view makes it either worth seeing or worth staying away from. Mostly, Miss Davis' costar is a capable actor, and anyone who may have doubts about that should look no further than his death scene as the Earl of Essex. Yet despite the solid production values, a rather entertaining script and the overall atmosphere of the picture, something seems slightly amiss. Perhaps it is because the two lead actors do not exactly register the sort of romantic chemistry this story requires. Olivia De Havilland, usually cast as Mr. Flynn's love interest in the studio's other costume dramas, is given the supporting part of Lady Penelope Gray. She has been underused in this spectacle, and her part could easily have gone to a lesser actress. 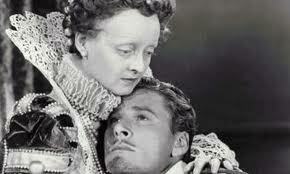 Similarly underutilized is Vincent Price who does well with a small but significant role as Sir Walter Raleigh. As for Miss Davis and her brand of acting, she's intense, and she's certainly dramatic, but it is obvious she is playing the Queen of the Warners Lot more than she is playing Queen Elizabeth I. It would have been a vast improvement if her performance did not lack subtlety and if it contained real luminosity. Nevertheless, this film is often extraordinary in spite of Miss Davis and its other shortcomings, mostly because of Erich Korngold's wonderful score; the costumes; the set design; and the cinematography. I can't imagine who'd want to stay away from Errol Flynn, easily one of the most charismatic and desirable actors it the whole history of cinema. No wonder Kevin Costner wouldn't wear those green tights! Who'd want to be compared? What was up with RKO in the mid-30s, casting some of their most urbane stars as backwoods folk, although the incongruity of Kate Hepburn in SPITFIRE probably made them come to their senses and not have Astaire do this role. Fox repeated this error some years later, in insisting another patrician actress, Gene Tierney, play the Ellie May role in TOBACCO ROAD. Arturo, when I was a kid watching these pictures, I remember figuratively throwing up my hands at some of the casting decisions made by the powers that be, including Gene Tierney in "Tobacco Road." Even as teens we could tell when somebody was really copping out. We felt betrayed, but we went anyway, because when the movie changed it was obligatory to go and see the new one. Sure, there was Martha Ivers. But for quite some time after her electrifying performance in DOUBLE INDEMNITY, Barbara Stanwyck, as filmdom's ultimate femme fatale, has been an actress in need of a suitable follow-up to Phyllis Dietrichson. This time, she's found it with Thelma Jordon, the title character of a picture where she is allowed to be even more dangerous and even more sinister than that earlier incarnation of evil. Miss Stanwyck's work as an up-to-no-good dame is first class, and audiences are in for quite a few jolts. Such a thrilling performance is guided by Robert Siodmak, whose direction is on par with Billy Wilder's best efforts. 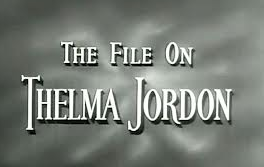 THE FILE ON THELMA JORDON is apparently a rather extensive one. In its most gripping moments, the film provides a powerful examination of the justice system-- a cautionary tale, if you will-- showing how someone can get away with murder and manipulate the system to her own ends. We see this when Miss Stanwyck's character is on trial, and it is rather clear she's not going to hang for her misdeeds. There is a long tracking shot as bad-girl number one is brought over from the jail to hear the verdict. Siodmak shows her marching along the street, up the steps and into the courtroom, almost as if it were a victory parade. All throughout this process, Stanwyck shows us the harder edges of the character while suggesting shades of humanity and vulnerability. Another benefit of this production is a special quality that Wendell Corey adds, expertly playing a pansy lawyer who gets sucked into her schemes to evade justice. The actors could easily chew the scenery in this one, but they wisely avoid the temptation to engage in such theatricality. THELMA JORDON may be guilty of many things, but she is innocent of that. Poor casting is mostly due to the studio system. i.e. studio had actors under contract and they wished to use those actors. Using actor NOT under contract cost more money. Why pay to get actor "X" when the studio already has actor "Y" and can use that actor for no additional cost. Producing the best product possible was NOT the main goal of studios during that era. I don't mean to nit-pick, but, for the sake of accuracy, the name of the 1930 Maxwell Anderson stage play upon which the Davis-Flynn film is based was called Elizabeth the Queen, not Essex and Elizabeth. It was a big hit for legendary stage actors and husband and wife team, Alfred Lunt and Lynn Fontanne. Some TCM viewers, in fact, may have seen The Guardsman on the channel, featuring Fontanne and Lunt. It opens, in fact, with the two actors recreating the Tower of London scene from Elizabeth the Queen. Brief as the sequence is, it's sort of fun to compare it to the staging of the same scene between Davis and Flynn. I love a quote that once came from Lynn Fontanne. When asked why she and her husband chose to only star in one film together the lady replied, "We can be bought. But we can't be bored." Now that is a witty response. Well in some way your correction is more than just nit-picking since there was a lot of discussion as it related to the title of the film. Since Flynn was a major male WB star at the time (I would say #2 behind Cagney), he wanted his role to be part of the title and he asked that Essex be listed before Elizabeth. Of course Bette wasn't going to accept that so they came up with a compromise. My guess (but only a guess), is that if male role featured an actor NOT as popular as Flynn the movie would of been released with only Elizabeth in the title. 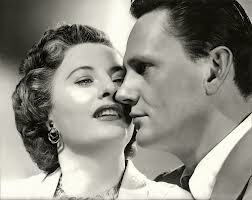 There's that great scene where she looks up at Wendell Corey and says "I guess I'm just a dame and didn't know it." Priceless. I remember Walter Matthau saying ... "I never knew that Wendell Corey could have that effect on women." Yes, Wendell Corey. Nobody would ever confuse him with Robert Taylor! She and Corey did make three pictures together. 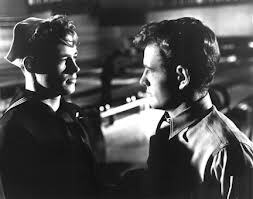 They were all noir, though THE FURIES has a western tinge to it. I can understand that, since there was no competition for entertainment dollars then. No TV, vaudeville was gone, and the only thing we had was a once-a-week movie. They could throw anything they wanted at us. Also, they had their own theaters then, so the product always had a venue. 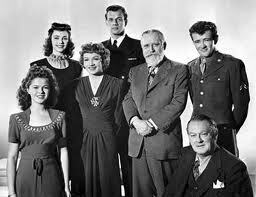 I think that 'no TV' may be the biggest reason the early studio system was able to crank out 'so so programmers'. While I understood this it really hit home when I was watching the Cagney Young movie Taxi the other day. Young's roomate made a point about going out to see a movie a few times in this movie. The way she made it sound it was similar to how many today would out to a fast food place for dinner. A very, very common activity. I almost forget that Corey is even in THE FURIES. He's like the 6th or 7th most important/memorable character in the film after Huston, Anderson, Roland, a couple horses, the Mexican woman with the knife, and the rope. "I never go to church, kneeling bags my nylons." Perhaps my favorite film line of all time. It wasn't the MAIN goal but it certainly was the goal of some production units within the major studios. No one was purposely trying to put out bad films. The dialogue sounds too much like a radio program, with too many characters thrown in and an inflated, overblown story to give it an epic feel. If you think this sounds like David Selznick, you're absolutely right. Selznick's exaggerated drama features a few fine younger actors, but some just aren't quite convincing. The bowling alley sequence with Jennifer Jones and Guy Madison lacks dramatic intensity. They could have sat around and picked their noses and it would likely have been more interesting. Shirley Temple, though, held this viewer's attention, perhaps due to the fact that she continues to sell her skill and professionalism, while Robert Walker shows off a truly magical quality, plus a skinny waistline that has to be-seen to be believed. 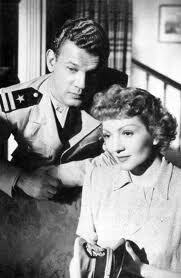 Meanwhile, Claudette Colbert and Joseph Cotten appear in the picture's central love story, if one can call it that. It is hard to figure out, because most of the plot details have been hampered by the production code-- the characters they play cannot even kiss, because she is married, though she seems to like spending a lot of time with a man who is not her husband. 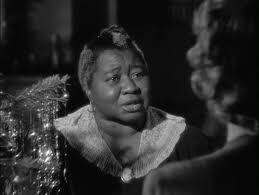 Agnes Moorhead and Hattie McDaniel show up and delight viewers with their usual sardonic quips. Yet it does seem that they have been robbed of genuine screen time given the film's endless number of minutes devote to other trivialities. Nazimova is on hand in a glorified cameo with even less screen time. However, Monty Woolley is featured more prominently in the narrative, and he manages to turn in a fine dramatic performance. 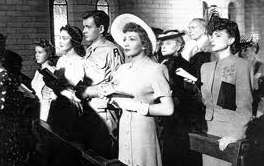 Yet despite all the good intentions, the film tries too hard to be an American MRS. MINIVER. Plus the soundtrack has so much over-dubbing on it, that again, it seems more like an interminable radio program than a truly substantial motion picture. 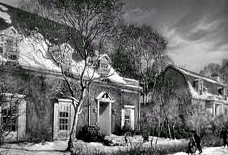 WHITE CHRISTMAS is a seasonal favorite cherished by many, but not by all. In fact, for some, it is a bit of a downer. The single biggest gripe may be that it is yet another of those pictures built around one song, leaving much to be desired in terms of plot and characterization. Danny Kaye has nothing to do with the picture's failings. In fact, he is easy to like in it and in a number of things. His countless awards, movie ticket sales and television ratings indicate that a lot of people like him in a number of things. Vera-Ellen's boney limbs have nothing to do with the picture's failings, either. A dancing toothpick can still be quite entertaining. This is Mr. Crosby's film, and he carries it off with the assuredness of an accomplished performer. But with the obvious exceptions of Technicolor and VistaVision, this is not a marked improvement over HOLIDAY INN, where he previously costarred with Fred Astaire. According to some sources, Mr. Crosby had asked Mr. Astaire to return for this outing, but Mr. Astaire, possibly fearing a terrible case of d?j? vu, politely declined. 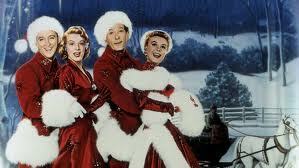 The earlier studio confection is probably better because of its more novel approach in presenting a holiday greeting that warms the cockles of the audience's heart with an exceptional song; instead of this repackaging which uses the same song, that has since become a standard, to save money on a new script and thus increase the commercial value of Christmas to Paramount. White Christmas? No. 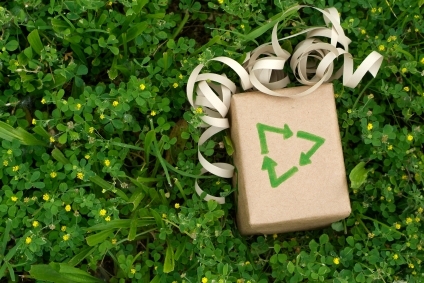 Green Christmas. This is Mr. Crosby's film, and he carries it off with the assuredness of an accomplished performer. But with the obvious exceptions of Technicolor and VistaVision, this is not a marked improvement over HOLIDAY INN, where he previously costarred with Fred Astaire. How right you are, TB. I never liked it. I had always loved "Holiday Inn," and I was affronted by this movie, which was such an obvious effort to cash in on the success of the song. 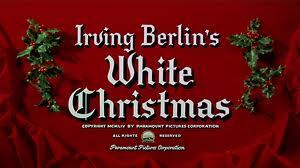 For one thing, Irving Berlin wrote such a raft of great songs for HI that I still remember so fondly ... just yesterday I was humming "Let's Start the New Year Right ..." I did enjoy a couple of things about "White Christmas," particularly Danny Kaye breaking up Bing in the "Sisters" number, and I'm very fond of Dean Jagger. I watch some of it some years, but when I do I sit here staring grumpily at it, shaking my head and thinking it was a waste to make it in the first place. The second film is sumptuously mounted, but it's flat compared to the first version. It's like a hollow piece of Christmas candy. I hope this isn't out of place, but I thought you might enjoy it. Alfred Hitchcock likes to vary the formula he uses to tell his great suspense yarns. In ROPE, he uses a story involving two young killers ripped from the headlines: the Leopold & Loeb case that rocked a nation in the 1920s. The effort is one of the director?s more stage-bound versions, having been adapted from a play, itself based on the real-life events. Hitchcock is tinkering with his cinematic formula, and he seems to be spending a considerable amount of time experimenting with long takes. Yes, the camera work does retain a certain amount of fluidity. 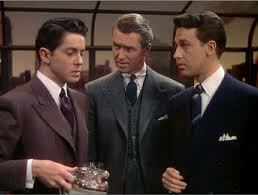 Nevertheless, the film engages the viewer, not because of gimmickry, but because of the performances by its trio of lead actors: James Stewart, John Dall, and Farley Granger. Their work compels the audience to find out what will happen to these unsavory characters. It isn?t a matter of whether their lives will end tragically, because their fate is fairly much assured. Rather, it?s more about just how tragic their lives will end. 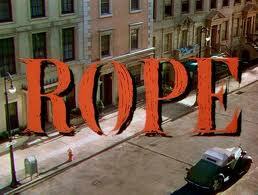 Excellent analysis of ROPE, TB. 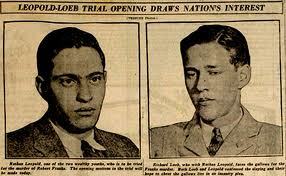 I watched a segment on Clarence Darrow, who defended Leopold and Loeb, and saw that Leopold was actually paroled. Loeb died in prison. The movie's opening was revolutionary, I thought. No lead-in, just the murder, as I remember. >No lead-in, just the murder, as I remember. Yes, a classic example of scene in progress. ROPE is probably my favorite Hitchcock film, because I think that while it has formalist touches, it is closest of all the director's work to naturalism. And it feels like watching very good theatre. I wish he had done a film with these types of long-takes and edits outside, something that would still seem like theatre but different since it would not be limited to interiors.